These are 4140 cr-mo pre-hard material. We heat treated the tips so they don't wear out after repeated use. A little anti-seize on the threads will prevent thread galling. 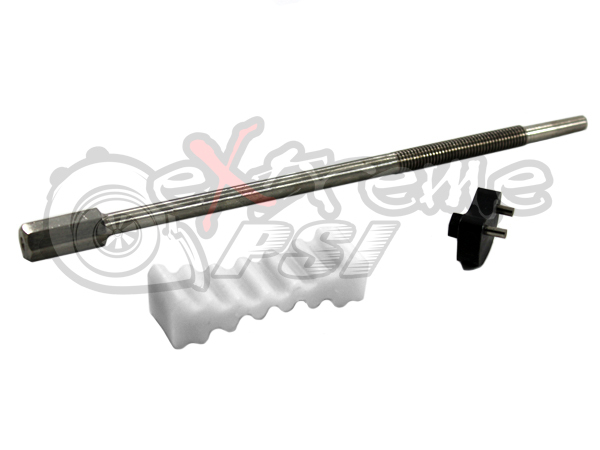 This tool will allow you to accurately apply the correct preload to the eccentric timing belt tensioner pulley with the engine mounted in the vehicle. This tool has a hex boss to accept your 8mm socket. For use on any 4g63 equipped vehicle as well as the Mitsubishi 3000GT and Dodge Stealth. Mitsubishi OEM tool # MD998767 equivalent. Want this item shipped out today, April 23? Order within the next 13 hrs 2 mins.